I'm not sure what I want to say in this post and I'm sure I will ramble - only that I'm sure I feel that I want to say something about the incident! A week and a half ago, part of our road was cordoned off by the police and family on Geraint Road soon told me that they had been woken up at 6am to police knocking on the door. It soon transpired that there had been a fatal stabbing at or 93 Launcelot Road opposite HAKA school at 4am. The same morning some crazy man had attacked an elderly choir group with a machete only a few miles away and there are a lot of teenage gangs in lewisham so all sorts were running through my mind in terms of safety for my children. A boy was the victim, he had just turned 16 only a few days earlier - I don't know any of the people involved or many details but what I've heard is that the boy who was killed was trying to separate two other children who were fighting at an unsupervised (seriously! Where the flip were the parents!) house party on a tuesday night! if your teenager is friends with kids with knives - you don't let them have a party without a responsible adult! - actually, that should be - you don't let them have a party full stop! The police and emergency services had spent about an hour trying to save the teenager's life but were sadly unable to. The police spent the day looking for the murder weapon and searched all the gardens and drains on Launcelot road and surrounding roads - including our own garden - a necessary but equally disturbing experience! I don't know if or where they found it. The following day, across the road from the murder house, in the afternoon, there was a safer neighbourhood stand with an officer letting people know that it wasn't believed to have been gang related and that retaliation wasn't anticipated. I don't know what would drive a person to carry a weapon to a party - let alone use it on someone - and again- not the person they were actually quarrelling with. When I was 15/16 I went through many interesting phases - goth, grunge, pagan, vegetarian, red striped hair - at that age you are trying out new things to discover who you might be and develop into - shame to think you could be killed for what you might be interested in or friends you are with at such a small part of what should be your total lifespan. 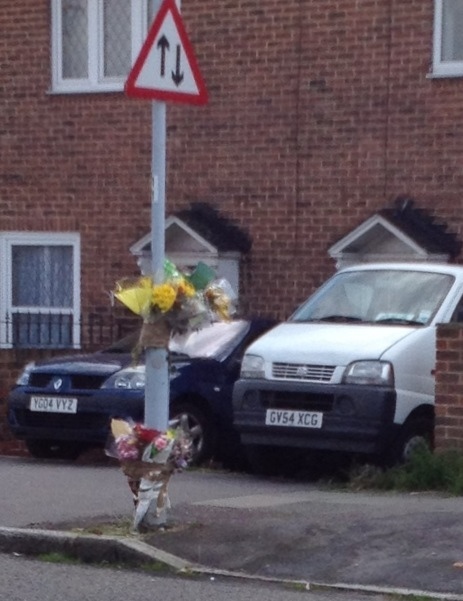 That safer neighbourhood stand only seemed to have been there briefly for the afternoon the day after the murder. Perhaps they felt that was adequate - there wasn't even anything about the victim - nameless. To me, a murder - whatever the reasons, a few doors away from my home - that is a very big deal. A week after, when I walked passed, the only thing to mark anything had even happened was a few flowers tied to a lamp post. That made me feel very sad - for someone who was only 16 and a few days old - I expected to see quite a lot of tributes. Such a young life taken for what I can grasp as silly reasons, a life not even named, no photos, cards, or candles and hardly any tributes. I don't think I will ever be able to understand why children feel the need to carry weapons (or viscous dogs) and actually use them fatally on each other, it is, in my opinion, ridiculous - this is the UK, a (mostly) good and lucky place to be a child, its not a war torn life threatening country and there can be no good to come from children with knives especially in a privileged country to grow up in - even the UK's most poverty ridden areas (which launcelot road isn't by the way) are in far better shape than other parts of the world. Why don't these children see how lucky they are? Don't geography teachers show what it's like in other countries anymore, don't their parents let them watch the news? if these knife carrying tough kids swapped places with kids in Syria - I wonder if they would see how much they should respect life? The officer on the safer neighbourhood stand had shocked me by telling me that in the borough of lewisham (where technically Launcelot Road falls - even though it's BR1) knife crime in children is a DAILY occurrence - raising two small children in the area - the future scares me. If so many children are carrying weapons capable of taking life, why are their parents, teachers and peers not doing anything about it? Children with knives - this is not ok. Such a shame and so much pointless sadness. Very sad occurrence , and reading from the perspective of someone living close by makes it all the more frightening. Raising a son fills me with fear and anxiety when I read this like this. You don't want your child to be a 'push-over' or stand by and see a wrong taking place and not doing some thing but at the same time you want them to be safe. You want them to come home in one piece at the end of the day. The teenage years are tough for all parents and no matter how close a parent and child are some times they don't always tell you everything for fear for causing worry and/or shame. Hence the saying 'The parents are always the last to know' chance are some parents didn't know their child was at the party, chances are many parents don't know or are afraid to find out if their child has or knows some one who carries a weapon. What's the answer, I don't know but I think we need to start by fostering closeness with our kids. Lead by example, try to get to know their friends and hope that it will be enough to keep them safe.